Ariel cruises past the Fish Bowl underwater Observatory in June 2015 at the Ellie Schiller Homosassa Springs Wildlife State Park. When Ariel was just a few weeks old, she was rescued with her mother Amanda in Lake Worth Inlet, located along Florida’s southeastern coast. It was Christmas Day 1973, and Amanda had been hit by a boat and had bad injuries caused by the boat’s propeller. Luckily, Ariel was not injured, but she would not have survived on her own. 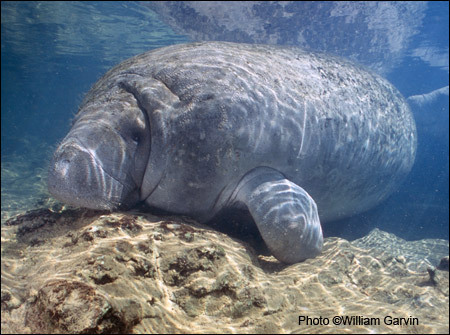 Mother manatees nurse their young for one to two years, and a calf may remain dependent on its mother during that time. The mom teaches the calf all the things necessary to survive, like where to find food and warm water. For this reason, Ariel was rescued with her mother and taken to Miami Seaquarium so Amanda’s injuries could be treated. Amanda was nursed back to health, and the pair lived at the Seaquarium until 1986 when they were moved to the Ellie Schiller Homosassa Springs Wildlife State Park in Homosassa, Florida. The park is one of just a few locations in the United States that is allowed to house and care for endangered manatees. Sadly, Amanda died in 2011 during a medical procedure, but Ariel still lives at the park, along with other female manatees Betsy and Electra. Ariel is large for a female manatee, tipping the scales at nearly 2,300 pounds the last time she was weighed. In the wild, manatees average about 1,200 pounds, and females are typically larger than males. However, Ariel is a bit TOO large, and her caretakers have been trying various methods to help her shed some pounds. Ariel is known for being curious, playful, and social. Ariel is also a curious and playful manatee. Once, when a park visitor’s shoe fell into the water from the deck of the observatory, she was the first manatee on the scene to investigate it and then proceeded to play with the shoe and push it around in the water. She is also fond of popping her head up above the water to observe park staff when they are talking during the manatee education programs. Ariel and “the girls,” as they are known, spend their days exploring the spring run and watching the park visitors in the Fish Bowl underwater observatory. Homosassa Springs, where the park manatees live, is the headwater for the Homosassa River, an important habitat for manatees in Florida. In 2010, Ariel and the other resident manatees at the park began sharing their spring habitat with free-ranging manatees when they were transferred to a smaller area of the spring for the winter. Their new accommodations include a supplemental heater, which they love! 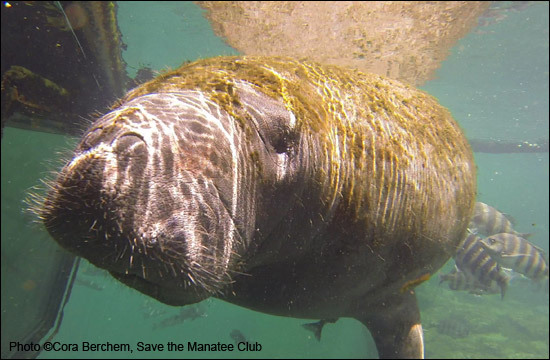 The gates, which were purchased by Save the Manatee Club, remain open during the winter, allowing the wild manatees access to the warm spring waters. When the weather warms up, the gate is lowered, and Ariel and the other captive manatees get the entire spring back to themselves. Betsy, Electra, and Ariel can still see the wild manatees through the fence, and the park staff report that the girls are interested in the wild visitors. In fact, Ariel has been seen spending many hours “conversing” with the wild manatees. If you visit the park and see two or three manatees together, Ariel is probably one of them. Some of the manatees seem to like resting alone, but Ariel can usually be found with another manatee. Ariel is an ambassador for all manatees, and when you adopt her, you are helping all manatees to survive. Each person who adopts Ariel will receive a full-color photo, biography, and adoption certificate, as well as a membership handbook and subscription to The Manatee Zone, a newsletter featuring updates on the adopted manatees when they are sighted, and Paddle Tales, Save the Manatee Club’s bi-monthly eNewsletter. For more information about adopting Ariel, go to Save the Manatee Club’s Adopt-A-Manatee® page, or call 1-800-432-JOIN (5646). If you are in Florida, you can visit Ariel and the other manatees at the Ellie Schiller Homosassa Springs Wildlife State Park. And be sure to check out other manatees on the Blue Spring webcams at ManaTV.org. Get some closeup views of Ariel at the Ellie Schiller Homosassa Springs Wildlife State Park. This video was taken by Cora Berchem, Save the Manatee Club’s Manatee Research and Multimedia Specialist.